Today, the most delicious Ethiopian food with a Mediterranean and Israeli twist comes out of the same kitchen as Jimmy’s Chicken Shack. It’s a space where you can finish your novel, meet a friend for lunch, sip on fair trade, organic coffee, or simply hang out. The owner and founder, Beejhy Barhany, was born in Ethiopia, raised in Israel and moved to New York fifteen years ago. Beejhy says her mission is to carry on the essence of the establishment’s former identity – a meeting place for wholesome food, art, culture and musical performance. Behind Tsion Café is an incredibly rich life story that led her here; from bungee and cliff jumping in the Amazon, to trading diamonds in New York, to serving in the army in Israel. Her passion to communicate her Ethiopian heritage, while highlighting her Jewish upbringing has led her to establish a space and platform where the richness of her life experience can be heard, seen, tasted, and experienced. Tsion Café is the physical manifestation of Beejhy Barhany’s personal story spanning continents and cultures. With sweet traditional tunes humming in the background, we start our chat. TADIAS: What was the inspiration behind Tsion Café, and why did you choose a location in Harlem? Beejhy Barhany: It is important for me to highlight Ethiopian culture and its rich heritage, and paying homage to my Jewish background. I moved to New York in 2000, and after living and working here for a few years, I founded BINA (Beta Israel of North America) as a way to create a platform to raise greater awareness about Ethiopian Jews. I started organizing events, film screenings, showcasing cuisine, stories, and music. It kept growing, expanding, I had an office, but I always wanted a venue. And I always wanted something in Harlem; it’s historical, it has some connection to Ethiopia. I was looking at a lot of different places, and I was interested in this particular venue. Jimmy’s Chicken Shack was once this exact place, where all the poets and musicians were spending time, I wanted to bring that back and carry on the tradition, I wanted to honor writers, artists, have readings and performances, and this place simply worked. TADIAS: Your drive to highlight the beauty of Ethiopian culture is so heavily influenced by your life; you’re Ethiopian, Jewish, a New Yorker. It seems Tsion is a byproduct of your experiences, and even with heavy revision, you’ve had a jam-packed life so far, so I wanted to start at the beginning, tell us a bit about your childhood. Beejhy: I was born in Tigray, in a small village; I don’t have much memory of Ethiopia since I left at a very young age. From the stories and vague memories, it was a peaceful life, surreal; I remember rivers, cornfields, eating fruit, climbing trees. I left the country with my family and started a journey to Israel, the holy land; we did it because of a strong determination connected to our religious ideology. In a way, we escaped with a mission in mind. We had people show us the way, make sure we didn’t bump into roadblocks, maneuver between villages, take us to Jewish villages to stock up with food and water. TADIAS: I think this particular journey that you have partaken in comes in story form to the rest of the country and the West, do you think the stories of the Ethiopian Jewish community may be somewhat misrepresented? Beejhy: I think it is something that is a bit exaggerated, we didn’t suffer in Ethiopia, I think that history needs a bit of revision. It depended on what area you came from. The image of Ethiopia in general that is exported into the West is not completely accurate. Surely, it was a difficult journey but it was a pure and spiritual passage that Ethiopian Jews carried out, not for economic opportunities, not because we were unhappy in Ethiopia, but because we wanted to be in Israel. The level of devotion was incredible, it was difficult on various levels but the people had an unbelievable drive. For instance, there was a pregnant woman walking among us, when she gave birth, people waited until she recovered to continue. We wouldn’t walk during Shabbat – the group had that level of devotion. TADIAS: I would imagine you had to take intentional detours, to avoid roadblocks and dangers? Beejhy: Yes, so we walked to Sudan and we stayed there for almost three years. I had a few family members and a cousin who worked with different NGOs and Mossad (the national intelligence agency of Israel) who had secret missions to get families to Israel. So, we were told to prepare, take pictures, pack, and one night we were picked up with a Land Rover and a Scottish and Kenyan driver, all under a secret operation. At the age of 7, I continued this epic journey, I remember sitting on the roof of the truck amongst suitcases looking at wild animals in the safari. It was magnificent time for me, but surely, for the elders it was frightening, especially passing through borders with a Scottish driver who was up for much interrogation. He was consistent in claiming he was a “tour guide.” The authorities wanted to know more, but with the connection and good sum of money, they were able to transport us through multiple borders. At some point I could see Ethiopia from Kenya, but that was the route you used to smuggle. We arrived in Uganda and hid there two weeks, until proper documentation was ready, from there we flew to Israel. TADIAS: So, after several years, you were finally in Israel. How was the first reaction, reception, and adjusting to a new life? Beejhy: It was a group of incredibly sincere people who had carried out this journey, and it was an absolutely emotional moment for us. The reception was two-pronged. There were so many who were excited to welcome us, the new Jewish Diaspora! Yet, there was some discrimination. The whole interaction between white and black was not easy – there was name calling on both sides. There was also the notion that you were not good enough, even after that level of devotion during the trip you had to reclaim your religion anew with Mikveh (the ritual immersion in a bath to symbolize the conversion into Judaism, to regain purity before entering the Temple). I was young, but I understood the process of the ‘new immigrant.’ I started a new life, new language, new home. I was integrated into all of it. I learned Hebrew. I met kids form Ethiopia and Russia, and after some time I started taking regular classes – I grew up. I learned to be very independent since all of my family members were integrating into a new life as well. I had to do homework by myself for instance. I decided to do my high school in a Kibbutz (a collective community based on agriculture, a co-operative life where everything is shared). Then I decided to join the army, and I served for three years. After that I wanted to travel the world, so I started with the U.S.
TADIAS: Okay, so now we are getting closer and closer to New York and Tsion. Tell us about the journey that ended in you moving to New York City in 2000. Beejhy: I had saved some money and went backpacking. I was twenty-two. I traveled a bit in the U.S., the Islands, then to Latin America. I traveled to Venezuela, Peru, Chile, Argentina, and Brazil, hitchhiking and backpacking. I did the Machu Picchu trail for a week. I mean the adventures were endless – I bungee-jumped, trekked snow mountains, did 100 feet jumps from bridges into rivers, walked the jungles of Peru. It was madness. I went back to Israel and I could not stay. I had seen too much. I went back to New York in 2000 and started babysitting for a Jewish family. I soon started a job in the diamond district managing an office. I started designing jewelry and trading diamonds while going to school, and graduated with a Liberal Arts degree from Fairleigh Dickinson University. In 2003 I founded Beta Israel of North America Cultural Foundation (BINA). Throughout my encounters in life, people did not know about Ethiopian Jews or Ethiopia in general. I wanted to create a platform to bring that richness to the world. I started organizing events and BINA was incredibly important in its role of discarding the negative images of Ethiopia; we are strong people with such a magnificent history, and it was important to underline that. After some years, it was clear that I wanted a venue, so the scouting for Tsion Café started. TADIAS: How did you decide on this particular location? Beejhy: It is quite ironic because when I first moved here, people told me not to go to Harlem. Now I live and work here. It was serendipity that we ended up here. I wanted a location that was near to home, because of my family, but also a place that demonstrated the history of Harlem. When I first saw the space I felt there was something to it, but didn’t know what. It was only just before construction began that we learned of the historic significance — any lingering doubts about the space was removed at that time. But, the place was like a junkyard, layers of flooring had to be taken out, walls taken down, everything had to be cleaned up. But eventually, it was up and running. TADIAS: Your staff is a creative bunch; the head chef is Samson Kebede, a bass player for ARKI sound, an Ethiopian Jazz band. Beniam Asfaw is the Art Director and curates work for the Tsion Art Show. Was that intentional when it came to things like designing the menu or the general ambiance? Beejhy: The food celebrates my upbringing, so we wanted to craft up something that was Ethiopian with a Middle Eastern, Jewish twist, a sort of hybrid. So we have something like Firfir (a dish made from shredded Injera, in a spicy buttery sauce) that is traditionally Ethiopian/Eritrean, but we also have the Malawa (a layered puff pastry dish served with eggs and tomato dip or honey), which is more of a reference to Yemen/Israel. We also try to be efficient with our ingredients; we serve fresh, organic food. The Ethiopian influence is there for sure, but we add a bit more to it. Soon, we will have some fresh bread and pastries to sell. We also have Ethiopian honey wine, and of course, we will have the traditional Ethiopian coffee ceremony. 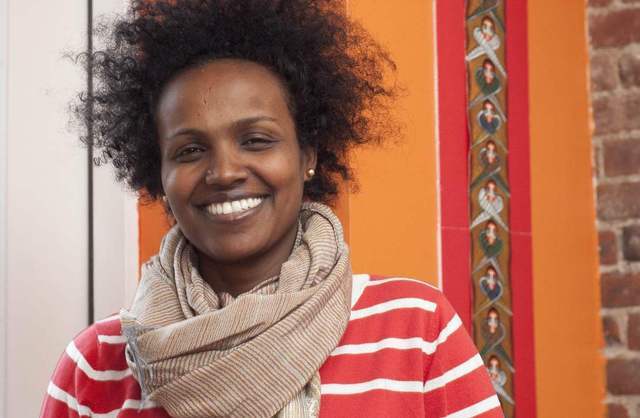 TADIAS: What are your hopes for Tsion Café in the coming years? Beejhy: I see it becoming a gathering place for the community – where writers can be comfortable to come here and finish their books for instance. We want to highlight art and culture. I see it as a place where we celebrate the diversity within Harlem, a place for growth of ideas, spirituality, and respect for one another, and in a way you will have a better understanding of Ethiopia. It is a space that is envisioned as a positive addition to Harlem. A gift from my family and me to the Harlem community. Tsion means the ‘ultimate spiritual place.’ You come here, and we fill you with good food and a good cultural grounding to all things Harlem — old and new. To submit artwork: Please be ready to provide your artist bio and artwork list (i.e. title, medium, dimensions and retail price for each artwork). Please include your name, address, email and phone number on your artist bio and artwork list and submit your art to Tsioncafe@gmail.com to be considered.